Register for the hike today! Hit the trail at CAGJ’s office in the International District and end in the Madison Valley, discover your foodshed by foot, and raise funds for the second edition of CAGJ’s Our Food, Our Right publication, which combines hands-on tools for change with community recipes and political awareness to engage YOU in joining in the struggle for food justice! See the Table of Contents here. Stops to include local food justice projects, union grocers, locally sourced restaurants, local food processors, and urban farms – Featured partners on the hike so far include the Danny Woo Community Garden, GroundUP Organics, and Green Plate Special! & stay tuned for more to come! 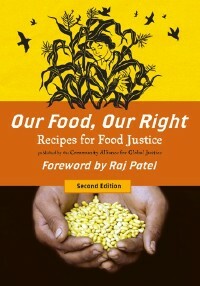 There will be lots of surprises and discoveries, and even ways to make your voice heard for food justice along the way. Bring your knapsack, walking stick, and hiking shoes! It’s easy to register as an Individual solo hiker or to Start a Team of hikers on our Crowdrise page. All hikers (solo individuals and hikers on a team) pledge to raise $50 to support Our Food, Our Right’s publication by asking their friends, family, co-workers, and community to donate just $5, or $10, or $15, or more to support great work. Teams make an even bigger impact by getting together a whole group of hikers for a day of fun, each of whom will raise $50. Bonus points for witty team names! Crowdrise makes it easy to meet your pledge goal – it provides you with an individual fundraising page to send out to supporters, tracks donations, and some tools (CAGJ will also provide you with a fundraising toolkit as well). Questions? Call CAGJ at 206.405.4600, or email us – fjp@cagj.org. We’ll also need a few volunteers the day of and in the lead up to the event, so do get in touch if you’d like to help out! This event is part of CAGJ’s Community Supported Publishing campaign, as we need your help to raise $5,000 to design and print our book with the quality necessary to distribute to libraries, book-sellers & food justice organizers throughout the land. We’re also seeking organizational sponsors, with benefits ranging from your logo printed in each book, to books donated in your name to your favorite organization. Click here to learn more about Sponsor Benefits. Thank you for your support!